During Kim Jong-un’s first foreign visit which was destined to Beijing, he met Chinese President Xi Jinping. The two leaders vowed to build up the relations between China and Democratic People’s Republic of Korea (DPRK) along the traditional friendship and the shared view on the current strategic issues. Since then, the two sides have moved towards each other rapidly and substantially. On May 3-4, Chinese Foreign Minister Wang Yi paid a formal visit to Pyongyang where he met Kim Jong-un and his Korean counterpart. During the meeting, Wang Yi reiterated that China and DPRK have reached a series of key consensus, which would enhance their mutual relations to a new higher stage. In terms of diplomacy, it refers to the warming links between Beijing and Pyongyang, because just one year ago, it was the same Wang Yi who described the relationship between China and DPRK as “normal” relationship rather than the allies, even though the treaty of friendship and mutual assistances has been valid. 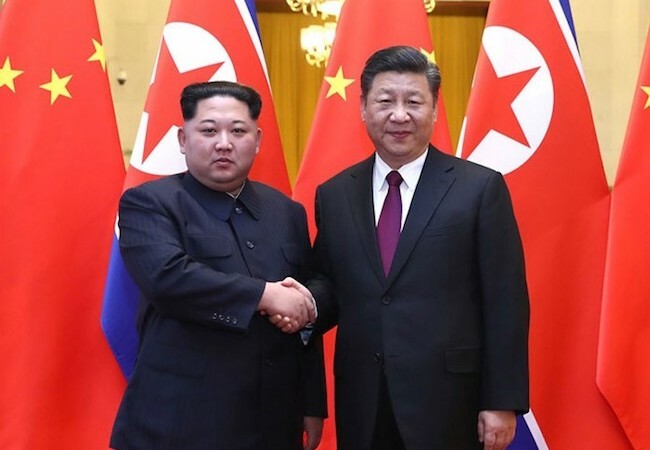 Yet, the sea-changes in DPRK’s politics and foreign policy have occurred after the meetings between Xi and Kim, which was followed by the Kim-Moon summit of the peaceful momentum. More significant is that Kim’s address on April 20 exposed that DPRK’s political priority has shifted armistice to peace. Given this, China immediately supports Kim’s demarche and once again taken the DPRK as a neighbor and an ally as well. In light of the turnaround in China’s attitude towards the DPRK, people might wonder what the central concerns are behind Beijing’s thinking in terms of the Korean nuclear issues. First, Chinese government has from the very start insisted on two essential tenets: The DPRK needs to abandon its nuclear weapon program gradually; then no war and no coercive change of the regime would be allowed on the peninsula. To that end, China has put forward the well-formulated “two-track” approach to the denuclearization issue. That is all the parties involved need to assure the DPRK’s security concerns, simply because the nuclear program came from Pyongyang’s concerns with its security and survival. As one of the key neighbors to the DPRK, China has been able to grasp the concerns from its weaker neighbor; also as a responsible great power in foreign affairs, the leaders in Beijing have argued for an impartial solution to the denuclearization issue based on the mutual interests and bilateral concerns. As the U.S. has kept up its “maximum pressure” on the DPRK, China alongside ROK and Russia have prepared to ease up the tensions all the time, even though the prospect of the war was approaching not long ago. According to Chinese interpretation, the “dual track” refers to the security concerns on the two sides rather than the one side. From the very beginning, China holds that the issue of denuclearization is central to finding a solution acceptable to all. For a long time, the U.S. sees denuclearization as the end of the DPRK’s nuclear weapons program and the DPRK has concerns about the U.S. military guarantee to the ROK and Japan as well, and the continued stationing of around 28,000 American troops in the south. However, the inter-Korean summit and the Panmunjom Declaration followed “confirmed the common goal of realizing, through complete denuclearization, a nuclear-free Korean Peninsula.” China has reiterated its endorsement to this move because denuclearization means different things to different sides. Now the success of the inter-Korean summit appeared to encourage Trump, for he had indicated his floated meeting with Kim might not take place. On May 4, he revealed that the location options had been narrowed to two or three sites and the meeting will take place in May or early June. Yet, the game is not over at this moment. Trump wants the DPRK to give up its nuclear weapons – irreversibly – as a first step, Kim is likely to see this only as a final move after receiving much in return. The Trump administration has to date said that sanctions relief or trade measures would only follow complete surrender of nuclear weapons. Once again, China comes to act as the “loyal broker”. Beijing suggests that in diplomacy, the concessions all sides are willing to make will be vital. Since Kim has already promised to end nuclear tests and close down a nuclear test facility, a move Trump takes as a concession and Kim did was a sign of the success of the DPRK’s nuclear program. The inter-Korean summit made some vital progress and opened the areas for cooperation. But as talks move forward, more will have to be put on the table. On May 4, Yang Jiechi, Chinese senior leader in charge of foreign affairs, called on parties involved in the Korean Peninsula issue to maintain the positive momentum that could lead to a resolution. He reiterated China’s commitment to the Korean peninsula’s denuclearization, peace and stability as well as a settlement of the issues through talks. He also told his U.S. counterpart Pompeo that all parties involved would be expected seriously to consider China’s proposal of a “dual-track” approach and address one another’s reasonable security concerns in a balanced manner. The “dual-track” approach calls for promoting denuclearization in the peninsula while establishing a peace mechanism there. To that end, China looks forward to working with all parties, in particular the United States, moving towards the consensus of respecting each other’s core interests and major concerns and resolving their differences and sensitive issues. In summary, since China vows to prevent the large-scale war from breaking out on the Korean Peninsula, it continues to pursue a nuclear-free peninsula but with the DPRK secured at the same time. China has made all efforts to alleviate the tensions with its neighboring countries in order to prevent Washington from “advancing its unilateral interests at the cost of China’s security.” Only in so doing, can China concentrate its all energies to the domestic development which is supposed to take 30 more years, and to insure Beijing to have built up a reliable strategic depth along its enormous border areas. Four words are the key to fully understand the turnaround in China’s policy towards the DPRK, that is, political stability, economic stability, social stability and strategic stability.